Steve Thompson with Neil Redfearn at Thorp Arch after his appointment. More confusion surrounds Leeds United this afternoon with news leaking out that assistant manager Steve Thompson appears to have been suspended. 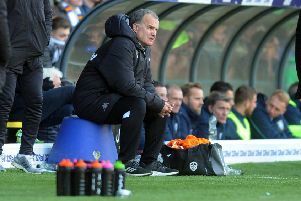 The former Blackpool coach has been in the number two role at Leeds for just over three months and has been credited with playing a part alongside head coach Neil Redfearn in the side’s revival in fortunes. But it has been reported that he was removed from his role this morning with no reason given for the decision and Thompson declining to comment. He was contracted up the end of the season as is Redfearn, about who there is bound to be increased speculation now. Redfearn remains in charge, however, ahead of Saturday’s game against Blackburn Rovers.